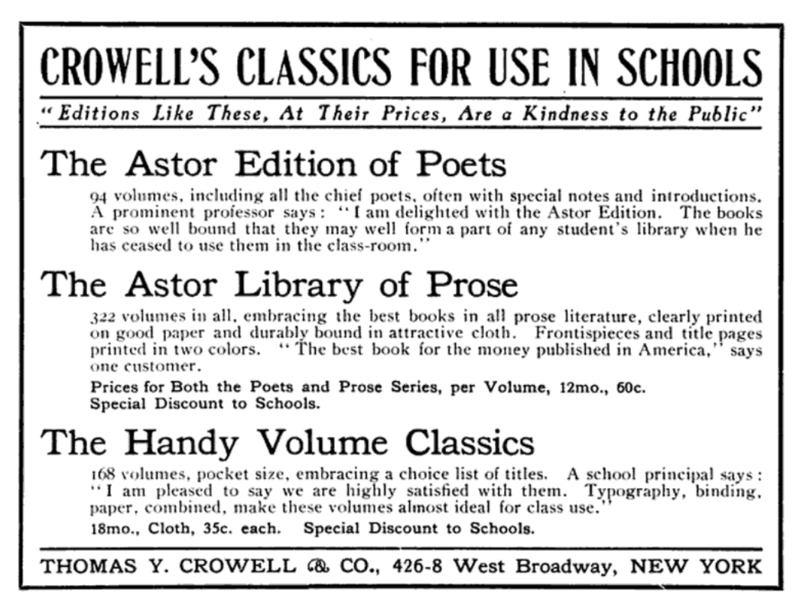 Crowell’s Astor Edition of Poets (or the Astor Edition, according to the jacket spine) was first advertised in 1896. 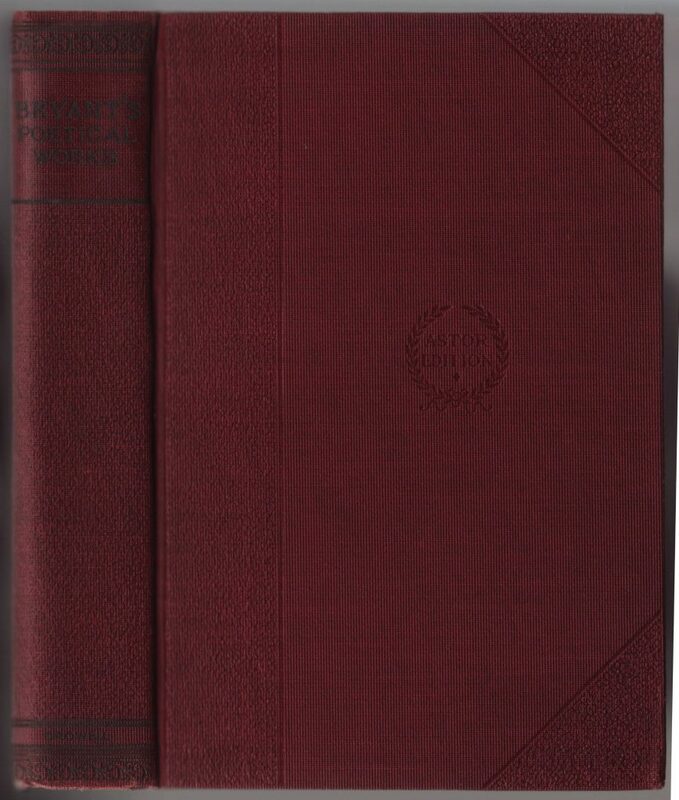 It was a standard series of major poets, decently bound and sold for .60 cents. The series was aimed at schools and colleges, which received a significant discount (.40 cents per volume). By 1906, the series had reached 97 volumes. 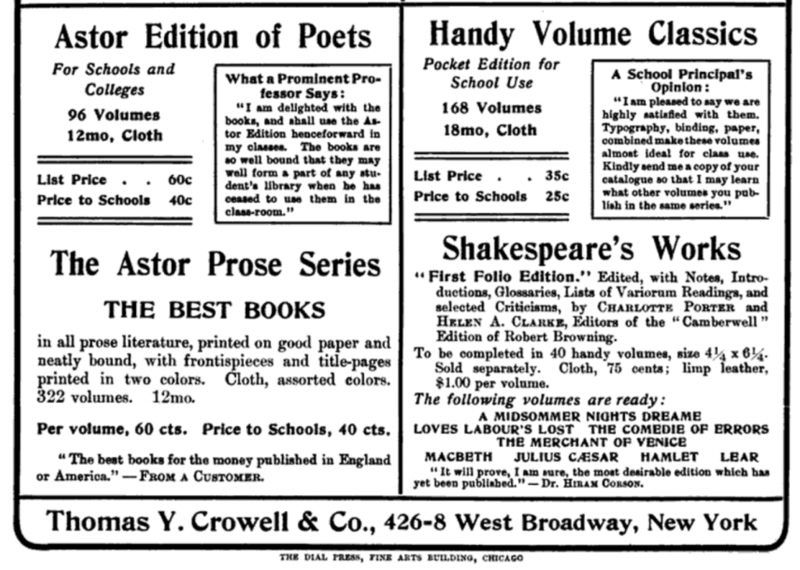 The advertisement (below) from 1907 uses a rather odd phrase to promote the series: “Editions like these, at their prices, are a kindness to the Public.” The Astor Edition of Poets is advertised along with the Astor Edition of Prose and the Handy Volume Classics. 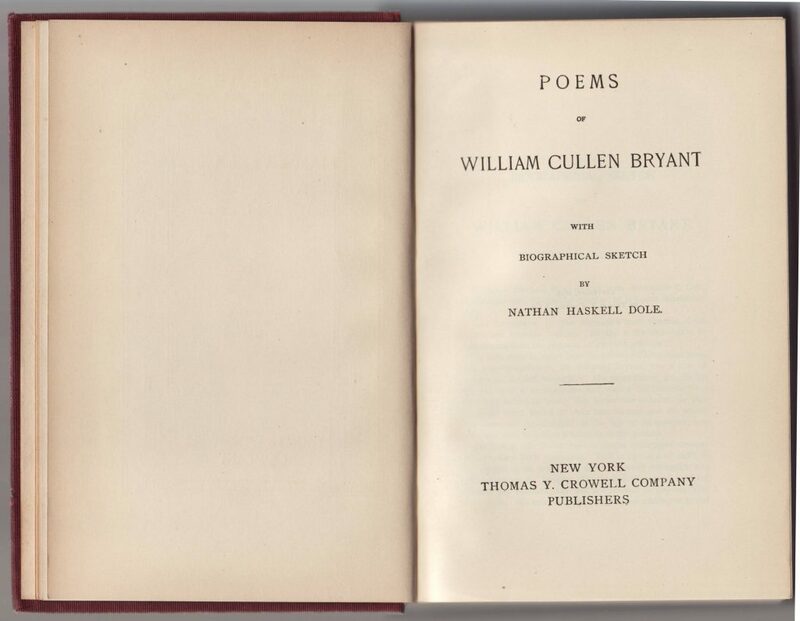 This copy of Bryant’s Poetical Works includes a copyright year (1893) but was printed later. 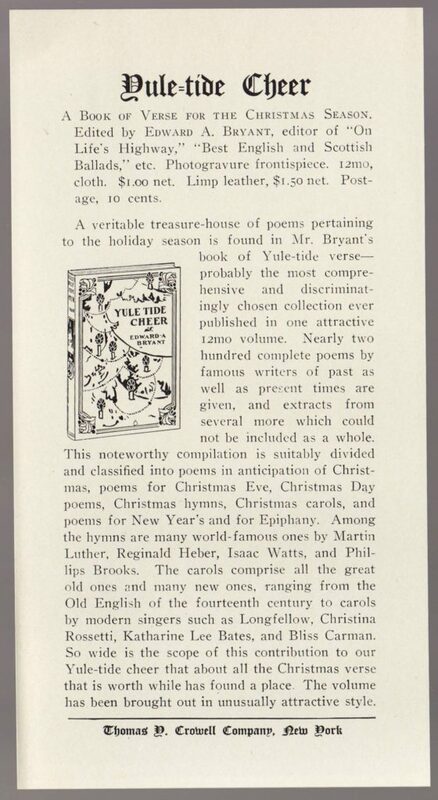 Given the nearly 100 titles in the series, this book, it was probably issued after 1907, and an advertising insert in the book probably dates it to around 1912 (when the advertised book was published). Jackets are common to the titles in the series. The spine includes Astor Edition in a series colophon. The front of the jacket includes the full name of the series also in a series colophon. The author and title and the author of a biographical introduction for the book are also indicated. 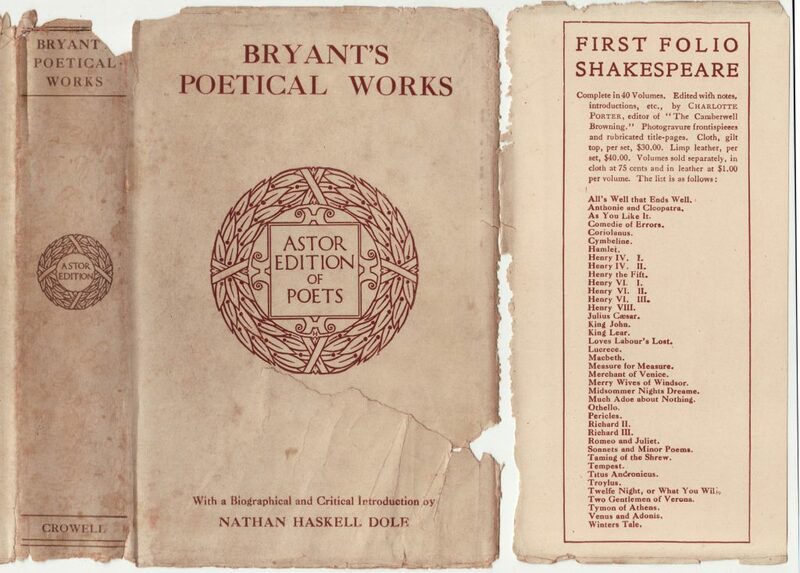 The front jacket flap advertises Crowell’s First Folio Shakespeare. The rear of the jacket lists about 96 titles. 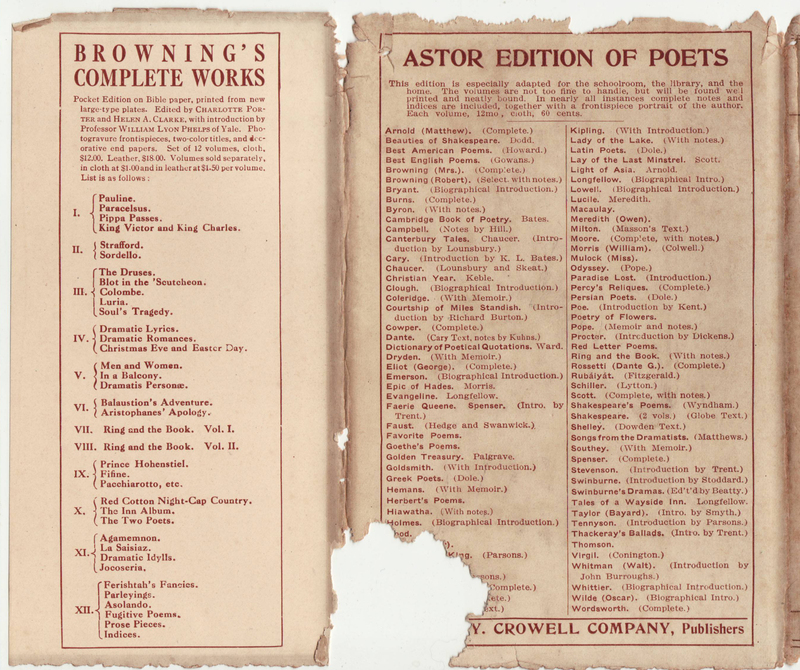 The rear jacket flap advertises Browning’s Complete Works. Bindings are cloth with debossing that mimics quarter binding. The Astor Edition colophon is also debossed on the front of the book. Oddly, there is no half-title page and two title pages in the book. 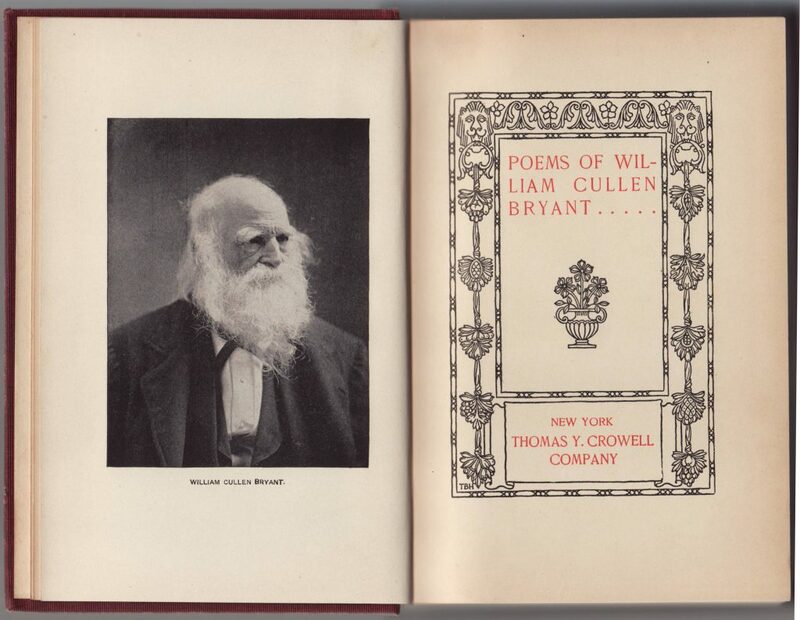 A portrait of Bryant faces a two-color title page with the Crowell imprint. A second title page is much simpler and includes the author of the biographical sketch included in this book (by Nathan Haskell Dole). It is possible that the first title page was original to an earlier edition of the book, and the second title page was added with Dole’s name, for this edition. One seeming requirement for books to be used in high school and college courses was the inclusion of a scholarly introduction, which was new to this edition of the book. Tucked in the book is an advertising sheet for A Book of Verse for the Christmas Season, edited by Edward A. Bryant. 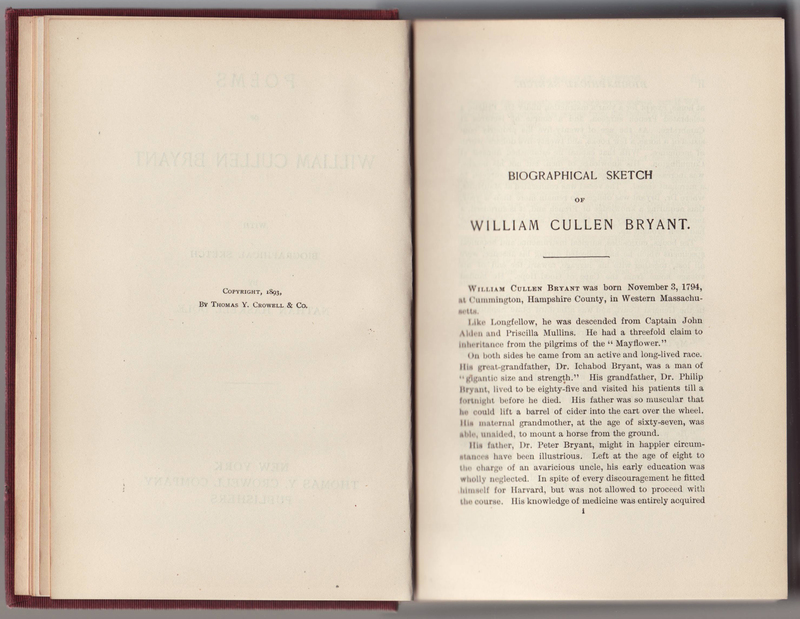 This book was published in 1912, thus probably dating the Bryant book to around 1912.